Hi Ray, been a long time hasn't it fella? I recall a story about an old man in a rocking chair on the porch of a general store, somewhere in Texas. A couple pulled up to the store in a Conestoga wagon, pulled by a team of horses. They asked him: "What are the folks around here like, we're thinking of a place to homestead?" He replied, "what were they like were you came from?" That's the reason we left, the no good #$%@*, The Old man said, "keep on headin west!" Then another couple pulled up, similar to the first. They asked the same question and this time their answer: "We loved our friends and neighbors, hated to leave them but we wanted to explore and seek new friends." The old man said: "You all just tie up right here!" Then they asked the old man: "Have you lived here all your life?" He responded: "Nope, not yet!" I will turn 68 on August 5 of this year Ray. Where can I begin? An Air Force Recruiter reminded all of the men in our Freshman Class: "I guess all you men know you are subject to the draft?" We looked at each other in surprise! he went on to say: "There is a way around this. If you join A.F.R.O.T.C. you will have two classrooms a week and two weeks every summer. When you graduate you will be commissioned a Lieutenant, and that will fulfill your Military requirement!" Well, Ray, that was lie #1. After completing O.C.S. & O.T.S., and a bunch of other stuff @ Lackland I was sent to Andrews A.F.B. and the Col. (his name was Sabinski) said you, Lieutenant, will be assigned to the 89th. Airlift, SAM 970. Do you know what that is? (I thought hell no I don't and wonder if you do?) I was told SAM meant "Special Sir Mission", that was Air Force One. At the time I couldn't have met a more honorable and charismatic man than President John F. Kennedy. When he was assassinated in Dallas, I didn't feel I could work under LBJ, and my tour was up so I got out. I went to work with my father @ Yeonas Realty in Virginia. After a couple of years there I continued to work on my Masters and then my Ph.D. at Georgetown under the G.I. benefits. I founded Major Realty Inc., then sold that to a couple and with a man I had met we founded "Real Estate Associates". We were licenses brokers in Virginia, Maryland and D.C. I relinquished my position as President when there was a disagreement in ethics and policy. Next I tried my hand as a Private Investigator, and one of only twelve in the State of Virginia who were licenses to carry. They called us "The Dirty Dozen". Damned near starved to death! I married and we had three children. Christian, Angela and Vivy Ann. Chris was killed in an automobile accent in 1992. My wife and I moved back to Missouri. I worked in an underground Iron Ore Mine there, as that was the only job I could find. We became friends with a Deputy Sheriff who told me one day there was an opening for a Deputy. I took it. Hell anything beat working in the mines? That was the beginning of my Law Enforcement career. When I retired as Sheriff I was invited to join the Missouri State Highway Patrol. After graduating from it, I worked as a Trooper and State Fire Marshal. This didn't put much in the bank and I started a heavy equipment business on the side; "Ozark Excavating Inc.". Then a big development started up next to where we lived, "Woodland Lakes". They asked me to start up a Security Force, which I did. Meanwhile I had always had somewhat of a talent for art & graphics. So I founded "Ozark Sign Company Inc."
When my son wanted to have his own business I asked him what he truly enjoyed doing. I told him if you don't really like what your doing, your in the wrong business. He had been cleaning swimming pools for several customers around town. He said, "I like girls and pools." That was when we started another business, "Ozark Pool & Spa, Inc." When Chris died I sold this business, and later sold the others too. 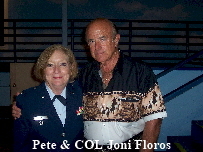 My bride is a retired Air Force Colonel, (naturally) and we travel and work together. I wish you could just condense all this stuff to one paragraph and do us both a favor OK? One last thing. In our yearbook someone tagged me with: "All experience is an arch to build upon". I don't know who it was, but kinda prophetic, huh?